The Heinz Endowments asked PROJECT RE_ to conceive of and construct a feature wall and reception furniture that represent their core mission areas of focus: Community and Economic Development, Education and Environment. The work was completed during a job skill training program that offers the opportunity for living wage employment upon graduation. Detailed fabrication and on-site installation provided apprentices with experience beyond basic welding certification; elevating the prospects of the recently incarcerated individuals, their families, and the communities where they reside. The project was a collaboration between the UDBS that engages students from all over the globe and the Trade Institute of Pittsburgh that teaches construction skills to people from the Pittsburgh region. An inclusive project implementation process aspired to educate individuals from different backgrounds about one another, while developing understanding, humility, and common pride. Much of the material used in the construction is repurposed or recycled, diverting waste from landfills. 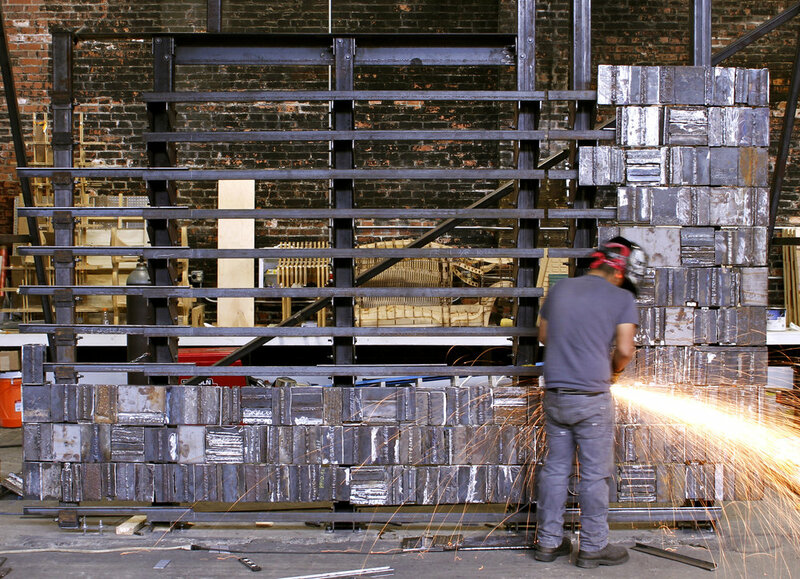 The wall system employs over 400 scrap steel blanks utilized in welding apprentice training to create a surface of aggregated aesthetic value. 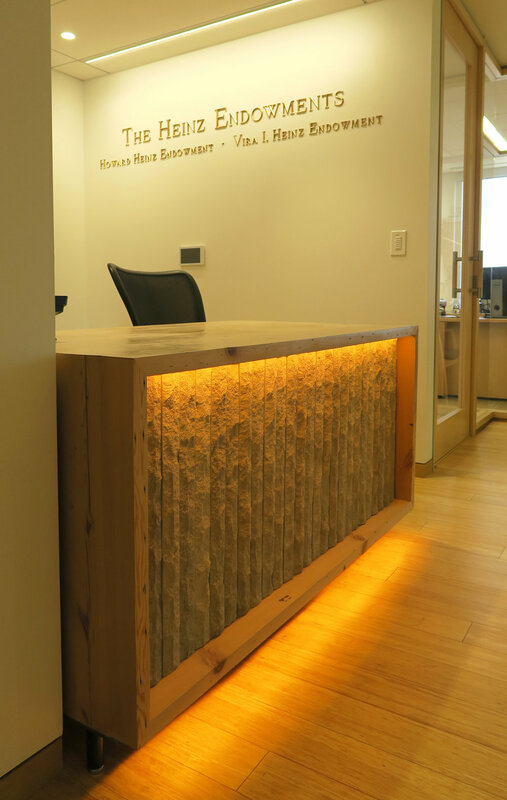 Reconstituted limestone and lumber are incorporated into the reception desk, a neutral compliment to the wall with a heritage specific to place. The wall and desk were delivered to site as complimentary pre-fabricated components. The 3,800lb weight of the steel wall required a secondary structural system to reinforce the high-rise building’s primary steel frame and navigate the parameters of the site. The wall was designed as a series of pre-fabricated panels that are lapped and installed sequentially to ensure a seamless composition. The process of constructing the wall and desk has given salvaged materials and people a chance at redemption.